The extinct craters in Pozzuoli are part of an enormous chain, now undersea, which runs out to the south on the seabed in the direction of Sicily. The entire sea between the Bay of Naples and Sicily thus contains its own "Ring of Fire," so-called in analogy to the mammoth ring of active volcanoes that perch on the perimeter of the great Pacific tectonic plate. Mt. Vesuvius has four undersea cousins to the south: Palinuro, Vavilev, Marsili, and Magnaghi. The last three were discovered in the 1950s…At present, there is some concern about the state of "dormancy" of Marsili. It is 3,000 meters high with the cone reaching to 500 meters from the surface of the water. Satellite cones of recent origin have been detected on Marsili. In any event, Marsili is a seamount volcano (that is, submerged) in the same Aeolian volcanic arc as the islands mentioned above. 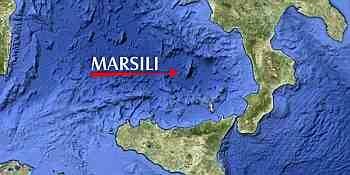 Marsili is right above those islands and 175 kilometers (109 miles) south of Naples (see map, above). Be glad you can’t see this thing; the seamount is 3,000 meters tall (almost 10,000 feet), about the same as Etna. The long axis of the volcanic structure (really two adjacent mounts) is NNE-SSW; the base is 70 km by 30 km ( 43 x 25 miles). The cone reaches to fewer than 500 meters from the surface of the water. Marsili is described as a fragile-walled structure, made of low-density and unstable rock, fed by an underlying shallow magma chamber. Although older reports said there had been no eruptions in historic times, the Italian National Institute of Geophysics and Volcanology announced in 2010 that Marsili could erupt "at any time," and might experience a catastrophic collapse. Vast amounts of magma would be released in an undersea eruption and a landslide that might trigger destructive tsunamis on the Italian coast. That report was a few years ago and made some headlines. Of course, "at any time" to a writer of headlines (motto: Scare the crap out of people today!) means tomorrow or the day after; anything beyond that is old dead junk. Thus, they have jumped on a more recent report from an oceanographic study by the National Interuniversity Consortium for Sea Sciences; the report says that studies of sediment and fossil remains show that the volcano has indeed been active in historic times—within the last 3,000-5,000 years. At least, says the report, Marsili should be moved “up” into the class of volcanoes such as the smaller ones in the Aeolians. The good news is that while gloom-and-doom sayers see vast devastation, you are free to see a new island rising, roaring up Atlantis-like from the deep. No one will have to be evacuated, and think of all the new land available for time-share condos. Call me a dreamer. *note: Friend Peter is referring to EEZ-Exclusive Economic Zone (EEZ), a seazone prescribed by the United Nations Convention on the Law of the Sea; the convention grants special rights over the exploration and use of marine resources, including energy production from water and wind. The EEZ stretches 200 nautical miles from a nation's coast-line. Not so fast, you say; the Med-bounding nations are so close to one another that every EEZ would overlap every other EEZ. Hmmmm, maybe that is why until quite recently no nation with a Mediterranean coast line has bothered to claim an EEZ. They would just have a war. Recently, some countries have proclaimed such things as Ecological Protection Zones to protect their marine resources. Italy did that in 2006, so I think we could keep Peter's "first drunken fisherman" from raising a private flag over the new island sovereign nation of Marsilonia & Guido's Pizzeria by claiming that a sea-mount volcano is by definition a marine resource and though beyond Italy's 12-mile limit, is well within the extended purview of an ecological protection act. Since Marsilonia is a physical extension of the volcano, the island, too, is protected. The island would be part of Italy. Quod erat demonstrandum ipso facto et cetera. That area of the "Ring of Fire" has at least one comic-opera-type episode connected with it. During the night of June 27, 1831, a small island surfaced off the coast of Sciacca, near Agrigento in southern Sicily. English, French and Neapolitan vessels raced to the scene to claim the island. The Neapolitans won and hoisted the flag of the Kingdom of the Two Sicilies, naming the new acquisition "Ferdinandea" for their King Ferdinand. Unfortunately for the bureaucrats and would-be colonizers, the island disappeared a few months later. Fortunately for 21st-century scuba divers, however, the island didn't sink that far, and now a good-sized underwater nature reserve thrives about 30 feet below the surface. The "Ferdinandea" episode made the papers in the summer of 2002 due to recent rumblings and small "seismic events" in the area. Active fumaroles are venting from the slopes of the sunken island. Is the island about to resurface? Probably not, say local geologists — but these are the same people who call earth- and seaquakes "seismic events." Time will tell.